The global emergency food market size was valued at $5,169 million in 2017, and is projected to reach $6,142 million by 2025, growing at a CAGR of 2.1% from 2018 to 2025. Emergency food is referred to the product that stored and consumed in case of emergencies or in uncertain situations. It becomes imperative to have backup of essentials to endure such uncertain situations such as continuous fluctuation in climatic conditions, economic unrest, or terrorist attacks and emergency food industry caters for the same. Emergency food products not only serve their value in emergency situation but also for various other demographic segments. For instance, they play an important role in day-to-day life of the working population, especially among the working female population which provide immense opportunity for emergency food industry to grow in terms of value sales. According to the United Nations, some of the North American as well as Asia-Pacific countries endure uncertain climatic conditions on a regular basis, which incur high margin losses to the economy of these regions. On annual basis, the U.S. incurs U.S.$944.8 billion loss majorly due to storms. On the other hand, China and Japan incur nearly U.S.$492.2 billion and U.S.$ 376.3 billion losses, due to various uncertain climatic conditions such as flood, earthquake, and tsunami. People living in such uncertain climatic conditions are in need of food having longer shelf life and worthy enough to be consumed. Emergency food products such as ready-to-eat meals, cereals, and dried fruits cater to the needs of these kinds of consumers, thereby fueling the growth of the market. Current and future emergency food industry trends are outlined to determine the overall attractiveness of the market. Several macro-economic factors have influenced the emergency food market trend due to decline in prices for various convenience food products, and rise in per capita income of consumers, especially in North America, Europe, and Asia-Pacific. Emergency food market play a crucial role in the defense sector. Army personnel are posted in war zones, where there is low access to food and water. In such situations, army personnel are forced to carry food and beverages on emergency basis. Thus, emergency food products such as dried fruits and ready-to-eat meals cater to their requirements. As a result, army sector is considered as the prime customer of the emergency food market. The emergency food market provides a wide range of product portfolio which caters to the varying needs and requirements of target customers. However, the penetrations of such products are low especially in economically undeveloped countries. In African nations, region experience uncertain climatic conditions due to which there is higher need for emergency food product. However, the distribution channel in these regions are low which all together hampers the emergency food market growth. In the defense sector, army personnel are posted in regions having limited supply of food and water. In such situations, these personnel carry food and beverages on emergency basis. Thus, emergency food products such as dried fruits and ready-to-eat meals cater to their requirements. Thus, the army sector is as the prime contributor for the growth of the emergency food industry. Based on product, the emergency food market is segmented into ready to eat meals, protein or fruit bars, dry cereals or granola, peanut butter, dried fruits, canned juice, non-perishable milk and infant food products. Among these products, non-perishable milk product accounts to higher value emergency food market share which is attributable to the fact the product penetration of various dairy products are comparatively high as compared to other products across the globe. However, protein or fruit bar segment is expected to grow at a significant rate in terms of value sales over the forecast period due to the easy availability of the product in various regions. Moreover, it incurs higher rate of demand from the defense segment. Protein bars of fruit bars further intensifies the growth of emergency food market forecast. Based on region, the emergency food market is analyzed across North America, Europe, Asia-Pacific, and LAMEA. North America is a matured and homogenous market for emergency food market with high product penetration. In North America, emergency food market has ceased expanding in recent years, however, in South America it has shown strong and continuous growth, particularly in Brazil and Peru. The recent calamities such as flood and storm in the region has affected into increase spending on food and other resources by the government. Moreover, the growth in Middle East economy, in terms of GDP growth rate has resulted in more spending on disaster management in the LAMEA market. However, weak economies in Africa has lowered the spending on disaster management and has hamper the growth of the emergency food market in this region. 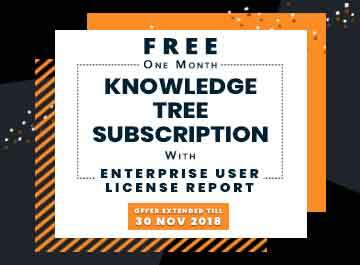 Major players in the industry have adopted strategies such as acquisition, partnership & agreement, merger, and geographical expansion, to expand their market share and increase profitability. Major companies profiled in the report include Nestle S.A., Kraft Foods Group, Inc., General Mills, Inc., Kelloggs, Conagra Brands, Inc., Pepsico, The Coca-Cola Company, Del Monte Foods, Inc, CHB, and Princes Limited. The report provides an extensive emergency food market analysis of the current and emerging market emergency food industry trends and opportunities. A comprehensive analysis of the factors that drive and restrict the emergency food industry growth is provided. 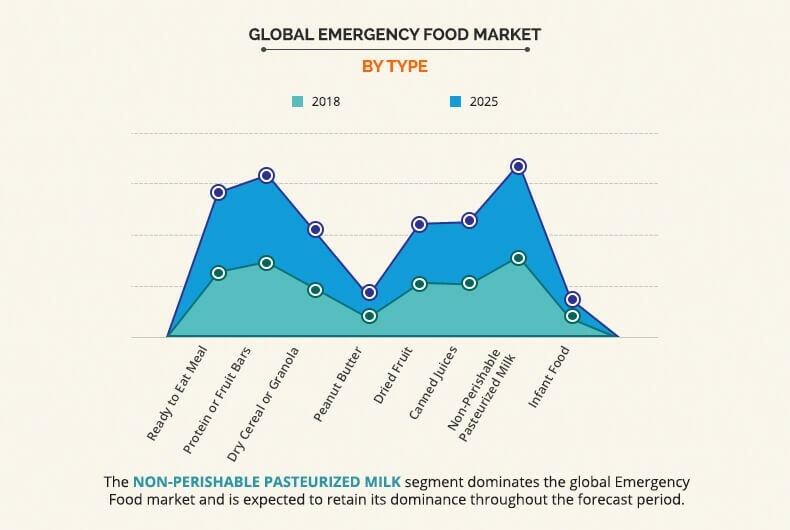 The report provides extensive qualitative insights on the potential emergency food market segments or regions exhibiting favorable growth. 6.4. Del Monte Foods, Inc. The emergency food market holds a substantial scope for global growth. The market, which is in its growth stage, is expected to contribute significantly to the global emergency food market in the next six years. With the rise in government spending across the food during the emergency situation is expected to drive the market across the forecast period. The rise in natural calamities in recent times and their impact on human civilization particularly in urban area will led to increase government spending on food and infrastructure in coming years. Moreover, the military segment is expected to gain higher traction over the forecast period. The army personnel posted on duty in regions experiencing uncertain climatic conditions or regions that have limited scope for food supply, desire for food product which can be consumed anywhere anytime. This provides immense opportunity for global emergency food market to gain traction in this segment. "Emergency Food market by Product "